It should not be a surprise to readers of this blog that I am a big fan of M.A.R. Barker's Tekumel and its first public incarnation, the Empire of the Petal Throne boxed set from TSR. I wrote about it way back here, discussing all its updates new rulesets, and probably have to update it further since new and exciting material, like Jeff Dee's Bethorm has shown up on the scene, and Brett Slocum's Heroic Age of Tekumel is in the offing. But what I really want to talk about right now is fanzines. I'm a fan of fanzines, in particular since they drill right down to a specific, almost obsessive, level. On the creator's side, they are a labor of love, rarely money-makers, closer to hobbies, and contain only that which the the creators themselves wish to see. On the consumer side, they are for a very, very small group who have a deep interest in the particular subject. One without the other, and the fanzine ceases to be by or for fans. Enter The Excellent Traveling Volume by James Maliszewski, who formerly ran the late, lamented Grognardia blog. It is a Tekumel fanzine, and even further concentrates on the original TSR (later reprinted by Different Worlds) versions of the game. TETV is a hand-crafted music box of a 'zine, each issue laying out expanded content for the game. The original set concentrated on Tsolyanu, but the booklets increase character creation for the Red Hats of Mu'ugalavyani, the Salarvya, and the descendants of the dragon-riders of N'luss (No, I'm not putting in the accent marks. Live with it.). This expanded section gives both personal names and clans of the nations, and bits about their culture and religions, and how they compare back to the Tsolyanu that most fans are comfortable with. Maliszewski also delivers in each issue patrons who can be the foundation of overland adventures. One of the challenges of Tekumel in its various incarnation has been a lack of what you do when you get there, though there have been definite attempts to rectify this. The patrons provide that vibe, very much in an old Traveller-style mode, where you get the background on the character, the job that is being offered, and then several options on what is really going on. It is both a good read and provides good hooks for the game. Also in the issues to date have been small adventures, originally part of a larger dungeons for more traditional adventuring, but now expanding to a full tomb or abandoned spaceship (why yes, they have spaceships in Tekumel - didn't you know?) Again, this hits up the old canard for GMs unsure about what to do with their characters. Lastly, there are articles about new monsters, or races such as the Mihalli, or various Underpeople. All within 32 pages of nicely dense text. And the art. It is charming in its own right, and evokes earlier zines like the early Unspeakable Oaths and old-school games like Arduin Grimoire. 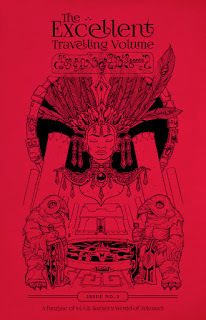 The cover shown above is by Zhu Bajie (A pseudonym from Journey to the West? ), and interiors range from OK to excellent. I am actually of two minds in recommending this 'zine. On one hand, it is very, very good, and if you are a fan of Tekumel, and the original EPT, then it is worth the cost (ten bucks a pop, Paypal only). But one of the greatest dangers of a fanzine it is its own popularity. Success often drives improvements to the work, but often robs it of its charm. I loved the original digest-sized, color-paper cover versions of the Unspeakable Oath, for Call of Cthulhu. It felt like from fans, for fans. That 'zine still exists in a glossy, irregularly-published version with more ads from the increasing Cthulhu market, but it's not the same. TETV is produced at Mr. Maliszewski's own speed, which produces excellent work but not a strict schedule (Call it Quarterly-ISH). There is no subscription (and with that no pressure to produce on a treadmill, allowing the work to grow), but he has a mailing list for announcing when the next volume is out. 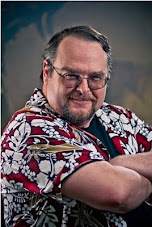 He has been making older issues available, and it is worth checking them out. 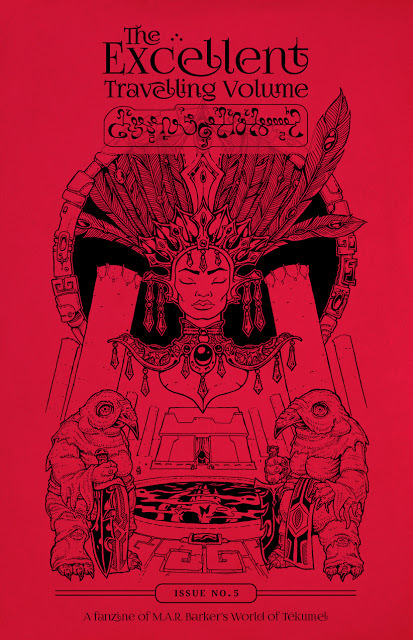 The Excellent Traveling Volume succeeds in its greatest form - it makes me want to play in Tekumel again. And that is high praise. I don't know if this is the weakest recovery from a recession, but it sure is the grumpiest. When confronted with good economic news of any stripe, we tend to view it in the worst possible way. It's too small. It's too weak. It's good but its temporary. Reminds me of an old joke. Grandmother and her grandson were at the beach. Big wave comes in and sweeps the child out to sea. Grandmother falls to her knees and prays "Lord, please bring back my beautiful grandson. I will honor your name. I will pray daily. I will volunteer weekly. I dedicate my life to your service. Just bring back my grandchild!" Another big wave comes in, and when it recedes there is her grandson, unscathed, with his sandpail and little plastic shovel. The grandmother looks up to sky and says. "Lord, when he LEFT, he had a HAT, you know." That's sort of the way we look at economic news. He had a HAT. Civil War II #1, written by Brian Michael Bendis, Art by David Marquez, Marvel Comics. OK, Jeff. 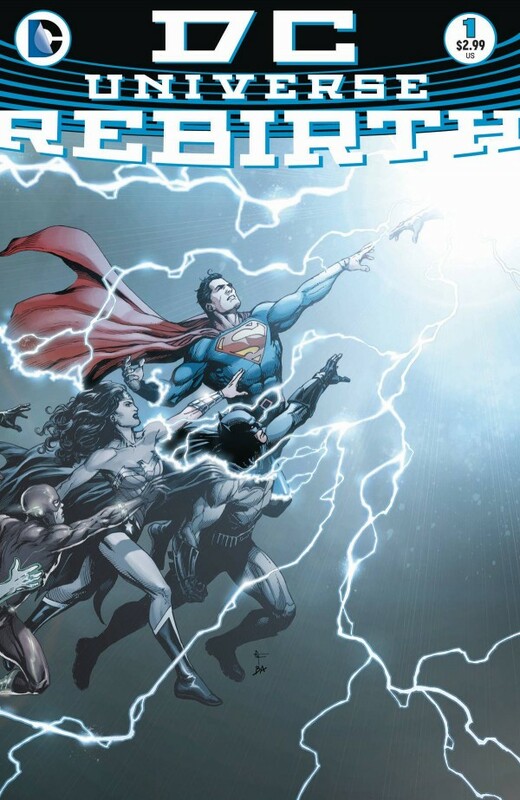 You're intrigued by DC's Rebirth and impressed with the new Captain America. Is there anything that gets your dander up in the current universes? 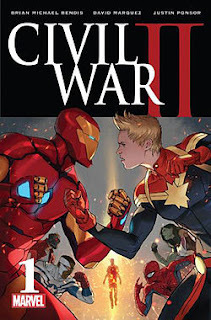 Civil War II is the latest of the big Marvel cross-overs. They are coming so fast and furious these days that they don't even bother to clean up the mess left from the previous cross-over. The old order keeps changing at a rate that most of the supporting books are continually derailed into the current crisis, not allowing them to build up much of a head of steam. No sooner than the universe get remade, than suddenly SHIELD was locking up supercriminals using a newborn Cosmic Cube, and the dust hasn't really settled from that before we're looking at another big epic and mores super-hero punchery. A young Inhuman is discovered who can see the future. He warns everyone about a big attack. All the superheroes get together and save the day. Then they have a party. Tony (Iron Man) Stark freaks out about an Inhuman who can see the future, leaves in a huff. Later, the Young Inhuman has another vision, about Thanos coming back. The Ultimates, headed up by Captain Marvel go up against him. In the battle, Tony's best friend Rhodey (War Machine) is messily and permanently killed. She-Hulk is last seen going into cardiac arrest. Tony freaks and flies off, intending to "do something" about all this. 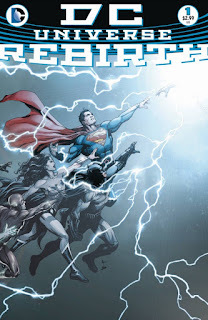 First thing you'll note is that the summary is a lot shorter than the ones I did for Captain America and Rebirth. That's because, while there is a lot of action and explosions and banter, there isn't a lot happening here. It's a first issue, but it doesn't really lay a lot of ground work. The assumption is that you already know these guys (Labeling is a big thing these days, just in case you don't). I could probably shorten that previous paragraph down to: "Tony Stark freaks out about something, intends to do something about it." Is Tony Stark freaking out his new super-power? It seems that this and making poor personal choices are more his power than repulsor rays. In the original Civil War, he freaked out and ushered in Super Human Registration Act, which pretty much trashed Reed Richards as a heroic character. I'll grant that in the most recent Captain America movie, Tony's freaking out is pretty much justified, and there he actually generates sympathy and shows some character growth. And now here he is, freaking out about a new Inhuman with a new power. And it's not that amazing a power. Dream Girl from the Legion of Super Heroes has this power, and you don't see her team freaking out. She's never wrong, but she's often mistaken. And we know from the front end of the book that the Young Inhuman's predictions are not foolproof, and can be avoided. Yes, people died when they tried to be pro-active about it, but that's not exactly the Young Inhuman's fault. And let's talk about the deaths, because that is what ultimately grinds my gears - permadeath for established characters as cheap rationalizations of actions. James "Rhodey" Rhodes was introduced back in the seventies, and took on the Iron Man suit when Stark was unavailable/ unwilling/ drunk. He got his own suit, and actually had a personality and some character development (with bonus points for dating Captain Marvel). He even earned a place in the movie universe. In a genre where the "fill-in guy" usually has a lifespan measured in mere issues (often dying just to have justification for the hero to take up the mantle again), he was a success story. And She-Hulk? Sheesh, she was an excellent character in her own right. Like Rhodey, she was a character existing in the shadow of a more marketable hero (she was Bruce Banner's cousin, injected with his blood), and to be honest, she did better. Her original run wasn't particularly sharp (Her big enemy was Man-Elephant), but as a member of the FF and in her later book, she really took on her own nature and blossomed. She was comfortable in her green skin, was a professional woman, and looked like someone who could actually fight. And when she didn't have her own book, she was part of team or a great supporting character, currently in A-Force and Hellcat. And she was often the grown-up in the room, neither cosmic nor grim. And yes, killing War Machine and potentially bumping off She-Hulk (simply to move forward a weak plot) bothers me more than Captain America saying "Hail Hydra". Good things about the book? Well. I like the banter. Bendis banters with the best of them, and I can read his banter all day. But when he gets to people saying things that are important, defending their actions, yeah, we break down fast. Tony's arguments are weak and, in a universe where things get remade on a regular basis, just plain weird. But for the most part, I'm going to drift through this one. Pick up the books I normally pick up, avoid the other tie-ins. This too will pass, as all things do. 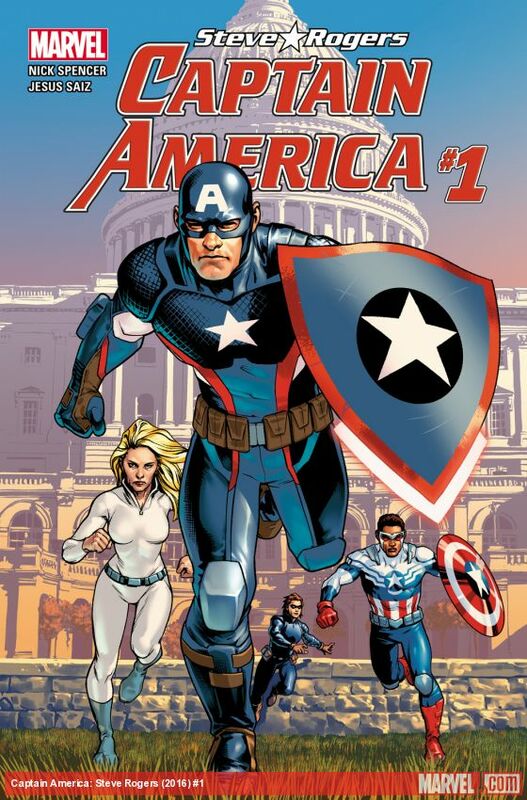 PS: Oh yeah, and now we're keeping an eye on Captain America. What does he say? What does he do? Is he manipulating people? 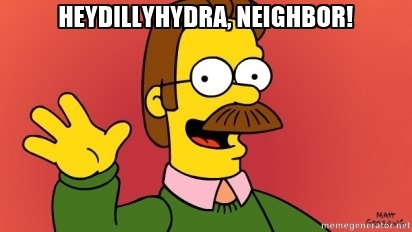 Handing out Hydra's business cards? That's part of the fallout of messing around with your major characters. [UPDATE: Well, Issue 2 is out, War Machine is still dead, She-Hulk is just comatose, which it turns out is just a plot necessity since the next big dream is that the Hulk is going to kill everyone, something which, oddly enough, they mentioned as a possibility in issue one. Foreshadowing. Maybe this will turn out to be a Red Skull plot as well.